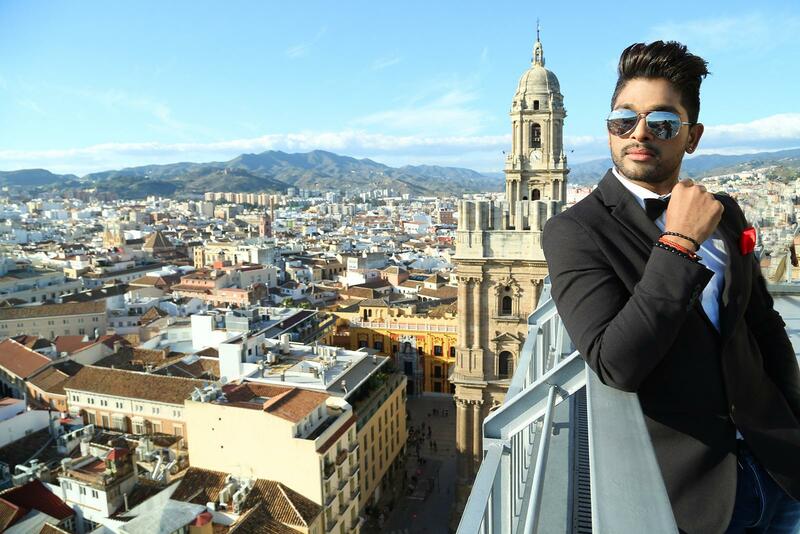 After their previous success with Julayi, Allu Arjun and Trivikram are back together again with Son of Satyamurthy. The film features appearances from Ali, Brahmi and most of the Telugu film industry stalwarts, but despite the plethora of comedy uncles, it strives for a more serious tone and is a more traditional family drama. Bunny puts in a restrained performance compared to his earlier films, and it appears that Trivikram has concentrated on character development rather than glitzy glamour and full-on action of most Telugu cinema. The storyline has plenty of potential and I loved the inclusion of villains who are not wholly evil but have the capacity for reformation, but there are a few misses. The film is undermined by the inclusion of a few unnecessary characters that reduce the overall impact and at times the sheer number of protagonists threatens to drown the main storyline. However the central theme of a young man determined to stick to his father’s principles stands strong and Bunny does a fantastic job in a more serious role than usual. Prakash Raj is Satyamurthy; a rich man who is happy to lend money to all and sundry without judgement or seemingly any expectation of repayment. He has strong principles and his values have been absorbed by his family even if they don’t always agree with his open-handed policies. And perhaps they had a point, since Satyamurthy’s sudden death reveals a large amount of debt. The family lose their affluent lifestyle and downsize their house, possessions and expectations when Satyamurthy’s son, Viraj Anand (Allu Arjun), refuses to default on the loans and insists on doing the right thing – as his father would have wanted. In an odd addition, Vennela Kishore plays Viraj’s older brother who is incapacitated by his father’s death, but as his character is played mainly for laughs (which are never very funny and don’t add anything to the story), there doesn’t seem to be any real need for his inclusion. Similarly, Ali appears as Parandhamayya, some sort of assistant to Viraj in his new job, who is another character who could have been omitted without losing too much from the story. I rarely find Ali’s brand of comedy funny but here he is less slapstick than usual and generally rather muted, so while I can’t see much point to his character at least he is tolerable and occasionally amusing. Although businessman Sambasiva Rao (Rajendra Prasad) blackballs Viraj, a friend helps by giving Viraj a job as a wedding event manager. Viraj is dumped by his own fiancée when loss of his fortune makes him less desirable as a husband, and naturally his first event is the marriage of his ex, Pallavi (Adah Sharma). This makes Viraj deal with his loss of wealth and prestige fairly early on in the film and also reinforces the contrast between his own morals and those of Pallavi’s rich but dishonest father (Rao Ramesh). In classic filmi style, Viraj manages to reconcile the various family members and in the course of events falls in love with one of the wedding guests. M.S. Narayana appears in his final film appearance here, and it is bitter-sweet to see him in one of his classic drunken uncle roles, especially when his role fits well into the storyline. Bunny’s Viraj is a sensible and responsible young man and he does a great job of making his character principled without becoming preachy or overly moralistic. The only misstep is his tendency to invoke stories of Hindu Gods that sounds a little odd coming from someone who hadn’t previously demonstrated any evidence of a virtuous attitude. It would have made more sense to me if he’d quoted his father instead, but perhaps that is due to my lack of Telugu and reliance on the subtitles which may not have been too accurate – going by the atrocious spelling as a general guide to overall quality! Subbalakshmi, aka Sameera (Samantha) is the wedding guest that Viraj takes a fancy to, and to her credit she immediately realises that Viraj is a keeper. In a move away from standard filmi heroines, Sameera is introduced holding a drink and a cigarette, and for some reason she is also a diabetic, although there didn’t seem to be any particular point to this other than as a brief comedy scene. I generally like Trivikram’s approach to his heroines, but he seems to lose interest once he moves on to the action and sadly Samantha disappears for much of the second half. However she is excellent in her role and has great onscreen chemistry with Arjun. The couple look good together in the songs too, which pepper the first half and allow Bunny to demonstrate why he truly is the ‘stylish star’. There is some annoying hair discontinuity, but since the worst bouffy hair only appears in the songs it’s actually no bad thing that Bunny’s hair length is shorter for the rest of the film. Rajendra Prasad and Upendra are the other standout performers and they both help bring the film to life. Much of the comedy is between Rajendra and Bunny, and is much funnier than the specific comedy threads with Brahmi and Ali. The two bounce lines off each other to good effect and are really much better than any of the assorted comedy uncles who fall flat in comparison. Upendra appears as the villain of the piece, and is as vicious and violent as required (per Telugu standard bad guy guidelines) but shows a different side when dealing with his wife and sister. He’s an interesting character and Upendra is excellent in the role, switching from demonic goggle-eyed evil one moment to concerned husband the next, but with so much else going on his role isn’t developed as much as I would like. Sneha is also very good as his sweet and serene wife, but Nithya Menen seems a little wasted in her role as a rival for Viraj’s affections. That’s a shame too as her character starts off well with an interesting plan of attack but it’s lost in the hodge-podge of action and Brahmi comedy that makes up the rest of the film. There is a lot going on in Son of Satyamurthy and it does evoke films of yesteryear with the convoluted storyline, sheer number of characters and focus on honour, values and moral principles. The songs from Devi Sri Prasad aren’t too memorable, but they are well choreographed and smoothly flow into the storyline. Bunny dances better than ever and also looks amazing with Peter Hein’s fight choreography. Interestingly the fights aren’t as brutal and violent as usual (there is a hose as a weapon for instance), but the wirework and acrobatics are outstanding and very effective. I really enjoyed Son of Satyamurthy and although it would have benefitted from fewer characters and less formulaic comedy it’s an entertaining story with some excellent performances. Well worth seeing on the big screen to really appreciate Bunny’s dancing if you can. This entry was posted in Tollywood and tagged Ali, Allu Arjun, Brahmi!, Devi Sri Prasad, M.S. Narayana, Nithya Menen, Peter Hein, Prakash Raj, Rajendra Prasad, S/o Satyamurthy, Samantha, Sneha, Son of Satyamurthy, Telugu, Trivikram, Upendra, Vennela Kishore. Bookmark the permalink.